Captain Olimar, an intergalactic explorer from the planet Hocotate, crashlands on a strange new world. With only 30 days life support, Olimar must repair his ship and survive the deadly wildlife. 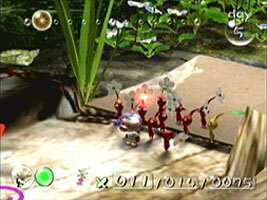 Luckily, he discovers a strange hybrid species, which he names the Pikmin, who follow Olimar and carry out his commands. You start with a single red Pikmin, but by having it carry pellets and felled enemies back to its Onion, more Pikmin will sprout. You also meet yellow and blue Pikmin, each with different abilities. You only get a set amount of time each day to search for ship parts, but as you repair it, new areas of the planet open up. Olimar's name in Japanese letters is spelled オリマー (o-ri-ma). If spelled backwards, it reads マリオ (ma-ri-o), after Mario. "Dolphin" was the working title for the GameCube hardware before it was released. 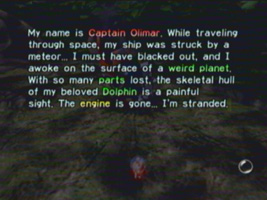 Many N64 and Gamecube games made reference to the Dolphin name. 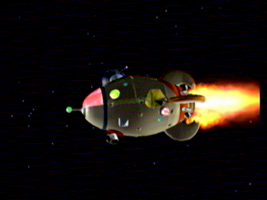 In Pikmin, Olimar's rocket is called the "Dolphin".